This week on My Favorite Pens we take a look at H. M. Smith, a small New York firm, and a wonderful tapercap overlay eyedropper! 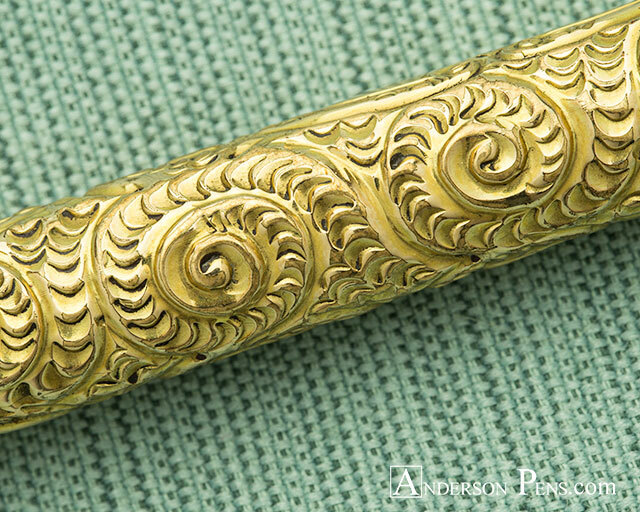 This outstanding pen was made in New York probably in the 1890 time frame. It is a classic example of early fountain pen manufacturer exhibiting both a taper cap and an over/underfeed. Posting the cap on the barrel end and you have what is similar in appearance to a desk pen or a classic dip pen, the taper distributing the weight back over your hand nicely. This pen came to me in the Chicago Pen Show Auction one year, but during the preview I noted there was no feed present on the pen. Still being amazed by the wonderful overlay, I bid on and won the pen for a very low price. During the post auction refreshments, a group of us were sitting and examining our wins when I opened the pen to find the feed had slipped back into the pen and was there all along! A quick adjustment and the pen was looking like it did over 100 years ago. The over/under feed allows the pen to be continuously fed with ink from both sides. 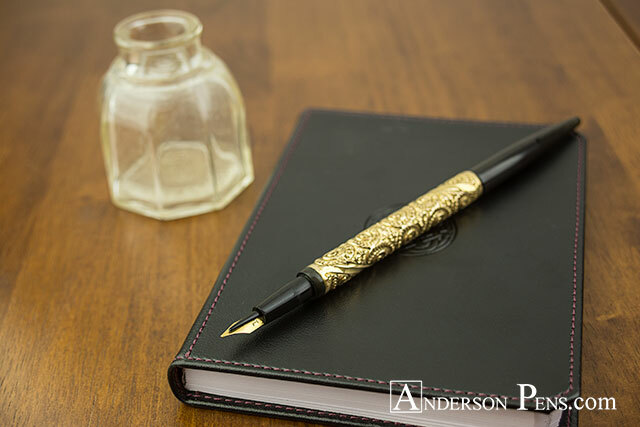 While some over feed pens do not have an underfeed, fountain pen manufacturers quickly discovered the underfeed would work just as well as an overfeed and would be less unsightly. Frankly, I love the look of an overfeed pen. The nib is a simple gold nib, just plainly marked “14k” on the top of the pen. No other markings are present. While there is some damage to the tipping of the nib, I’ll elect to leave as is for now. One might wonder how we attribute this to H. M. Smith when there are no markings as such. Well, we can only go by what we know as other examples of their work and the similarities between them. This is where owning pen books becomes important as there are many good (and now discontinued) books out there with some fantastic early pens shown. The pattern is a Snail or “chased” pattern and was a common pattern during this time frame. The overlay work was all done by hand and you can see the tiny imperfections present in hand worked overlay pens. This is a gold filled overlay, and features a neat band that works its way around the barrel and through the snail pattern. A nice interruption in the pattern. 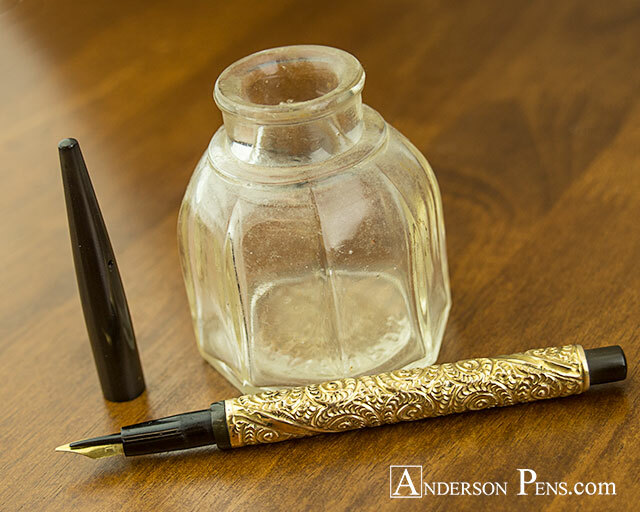 Oddly, the pen was never engraved with an owners initials, a very common sight for overlay pens of this period. 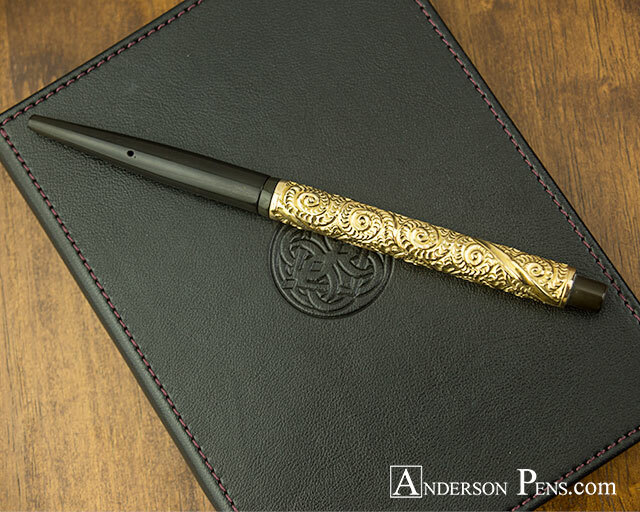 The combination of the taper cap, over/under feed and beautiful overlay pattern are what makes this one of my favorite pens. This entry was posted in My Favorite Pens, Vintage Fountain Pens and tagged My Favorite Pens, Vintage. Bookmark the permalink.